Vietnam's most luxurious hotel, The Reverie Saigon, is among the Top 100 hotels in the world and offers a truly unique experience to guests. Waking up in the morning in the highest hotel in Ho Chi Minh City can bring an extraordinary feeling as one takes in the breath-taking panoramic views through floor-to-ceiling windows, sky-high over the Central Business District, while also overlooking the charming, winding flow of the Saigon River. The Reverie Saigon was honored as one of the Top 100 hotels in the world by prestigious magazine Elite Traveler earlier this year and was the only hotel in Vietnam to receive this recognition. As the only member of Leading Hotels of the World (LHW) in Vietnam, a global collection of luxury properties comprising over 400 hotels in 80 different countries and territories, The Reverie Saigon stands as Ho Chi Minh City’s tallest hotel, soaring to the top of the 39-story Times Square building with an interior resembling a dreamlike escape into a world of Italian opulence. With frontage on Ho Chi Minh City’s two most storied and crowded thoroughfares - Nguyen Hue and Dong Khoi - the hotel beats at the very heart of the city’s expensive downtown area and is within walking distance of many of the city’s iconic monuments. Renowned for its beautiful interiors, The Reverie Saigon also raises the bar for services and accommodation in Vietnam. Crafted to perfection, guests can indulge themselves in one of the magnificently-furnished accommodation options in 286 rooms and suites as well as 89 full-service luxury apartments. Stepping into the ground-floor lobby of the hotel, guests are impressed when looking up to the stunning ceiling with its individual pieces of hand-blown Murano glass, reminiscent of a geographic silhouette of Vietnam. 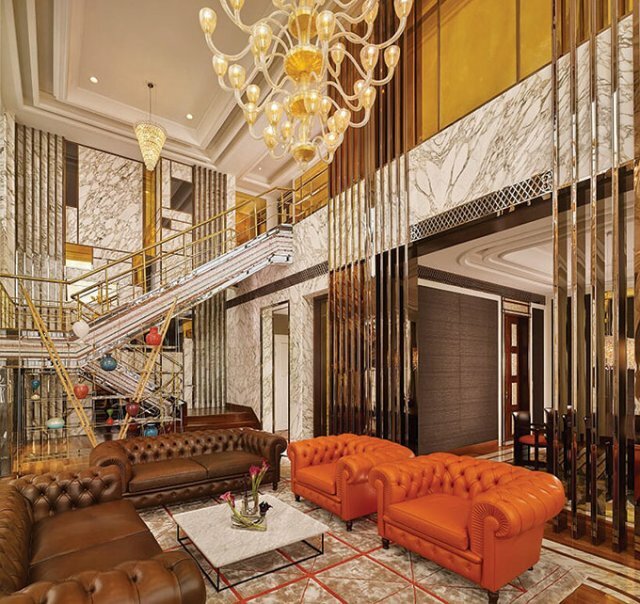 The other reception lobby on the seventh floor is also worth spending some time in and taking a seat on the five-meter Colombostile sofa, made from purple ostrich leather, while admiring the Murano glass ceiling installation - as mentioned by Elite Traveler. This is also one of the most ornate and impressive spaces for guests in the hotel, with its aerie design, grand views, and decor that includes a custom-made, three-meter-tall emerald-green Baldi Firenze clock. Extravagance and splendor describe The Reverie Saigon, as it really does boast a design experience like no other. Surrounded by art and architecture, once inside it’s unmistakable that design is at the core of the hotel, with a wealth of Italian design companies, including Colombostile, Visionnaire, Giorgetti, Poltrona Frau, and Venini. These designers are prominent throughout the hotel and its residential suites. Staying in an extravagant and luxurious space while feeling “at home” is exactly what the residential suites bring to guests - be it for one night or more. Residential guests are welcomed at a separate private area in the ground floor lobby for a personalized arrival experience. The hotel pays particular attention to satisfying every single need of family travelers, with a fully-equipped modern kitchen, washing machines and dryers, a private workspace, and a large living room for children and adults to entertain or keep themselves entertained. In the most crowded and busy location in the country, business travelers and holiday makers are still able to find a peaceful spot with beautifully-appointed accommodation to enjoy with their families. To celebrate its success, The Reverie Saigon is offering an enticing “Suite Dreams” package for discerning travelers in Vietnam to experience a resort-style stay in the downtown area at one of Asia’s top luxury hotels. 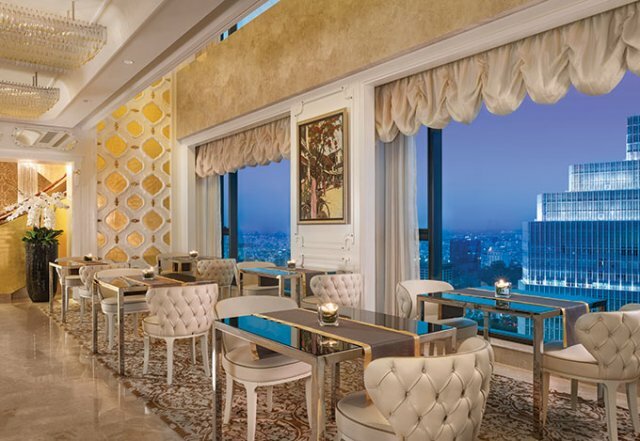 In addition to staying in a Residential Suite rich in design details and featuring panoramic views, the package includes a generous $250 (VND5.75 million) hotel credit per night to splurge on creating the ultimate urban escape. The array of services and experiences guests can choose to freely spend their daily credit on includes meals at The Reverie Saigon’s exquisite fine-dining restaurants, indulgent therapeutic treatments at the award-winning spa, access to The Reverie Lounge (a sky-high perch from which to enjoy breakfast, afternoon tea, or evening cocktails and canapés), airport transfers. in one of the hotel’s luxury house cars, dedicated butler service, and more. Elite Traveler recommended guests not miss the chance to unwind with holistic therapies drawing on Asian traditions at the two-story The Spa at The Reverie Saigon, where a floral mosaic staircase by Sicis of Italy connects the floors. The Reverie Saigon promises an indulgent, sophisticated and relaxing stay for every guest, and discerning travelers always ensure it is at the top of their list when visiting Ho Chi Minh City.